This is an excellent opportunity for the right candidate to work and learn about stock free organic principles of field-scale food production at an award winning long-established horticultural farm in South Oxfordshire, UK. One person full time fixed-term position for candidates keen to learn more about organic principles of field-scale food production. Training will also be given to operate irrigation equipment. Opportunities to attend on-site workshops and seminars. We attract a lot of interest from people from a wide range of backgrounds who come to see what we are doing here and we are a demonstration farm holding regular seminars and farm walks. Different people turn up to work at odd times so there is a lively atmosphere to the place. • Team leadership in the field, for planting/hoeing/harvesting operations. • Flexibility in working hours/days. 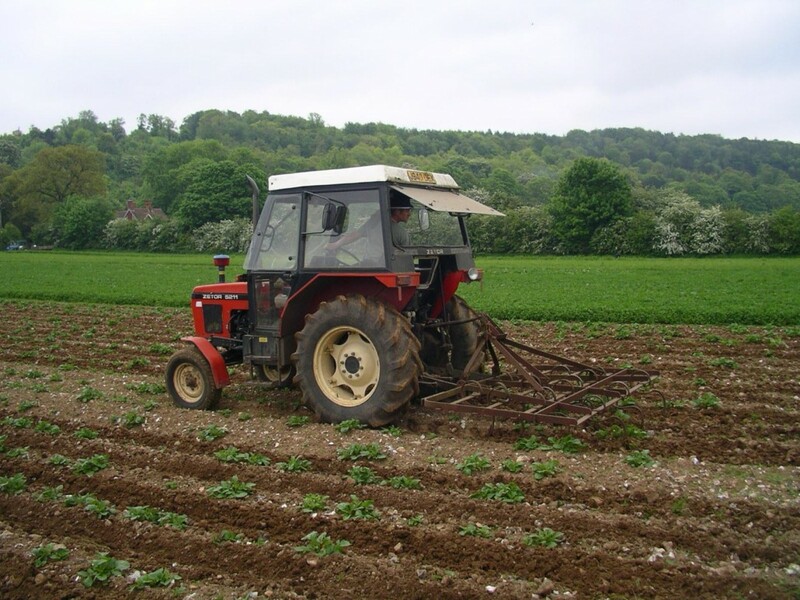 The main part of the job is to grow field vegetables on our 17 acres using a range of equipment and tractors. You will also be working alongside our team of 3-7 in the walled garden and fields and be expected to lead the team for field operations. You will sometimes be expected to work alone. Two days each week are harvesting and packing vegetables for our own Box Scheme and wholesale customers and you may be asked to help. Planting, hoeing, crop tending, mowing/growing green manure and harvesting being the main work, which is varied; it is unusual to be on the same job for more than half a day at a time. Local deliveries will be expected on odd occasions, using company vehicle. Operating irrigation equipment, you will be trained to do this, using and maintaining farm machinery. The job is fixed-term from April to November, with a month probation period. The contract can be negotiated for recurring terms every year from April to November or as a permanent job in the future. Hours in general it will be no more than 40 hours per week, but more may be expected during busy periods in the summer. Occasional weekend work may be needed during the summer. Rates of pay are higher than minimum wage and are negotiable. Payment will be made monthly, in arrears. Holiday entitlement is according to UK Employment Law. Accommodation on site in a three-bedroom shared flat. It is essential that the applicant is prepared to live on site as there are regular tasks during the summer to be seen to. Vegetables are available free of charge for personal use. References from most recent employers/tutors will be sought at offer stage. http://www.tolhurstorganic.co.uk/wp-content/uploads/2013/04/S-tine-spuds-3.jpg 1200 1600 Tolhurst Organic http://www.tolhurstorganic.co.uk/wp-content/uploads/2015/07/tolhurst_organic_logo-300x135.png Tolhurst Organic2019-02-07 09:57:492019-02-07 10:02:05WE ARE HIRING! Little Gem and Sweet Dumpling Squashes What Makes for a Successful Organic Farm?